South Korea’s commerce minister says first-stage talks for a free trade deal between Beijing and Seoul could be finalised in September this year. “The sixth round of Sino-Korea FTA talks will be held from tomorrow in Busan, and the seventh round will be held in China estimated at between August and September,” Yoon Sang-jick, Minister of Trade, Industry and Energy told reporters at a briefing. China is South Korea’s biggest trading partner. The Republic of Korea recorded its lowest growth since 2009 last year. The minister suggested that first-stage talks could be finalised in September if an agreement is made between Chinese President Xi Jinping and South Korean President Park Geun-hye for the completion of the bilateral free trade agreement (FTA). 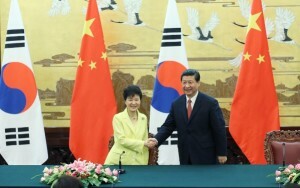 President’s Jinping and Park both reaffirmed their commitment to the proposed agreement during talks in Beijing last Thursday. Seoul and Beijing will hold the sixth round of FTA talks for three days at South Korea’s largest port city of Busan. During the upcoming round it is expected that the country’s will come up with a draft for procedures in each area, which will reflect the stances of both sides. The formal negotiations for the Sino-South Korea FTA were launched in May last year. China and South Korea are also seeking a trilateral free trade deal with Japan.